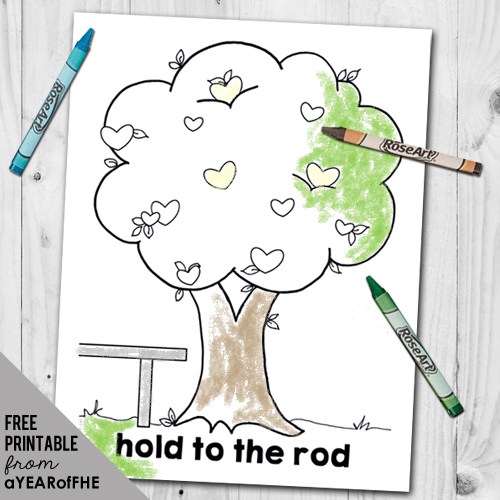 What You'll Need: scriptures, GAB 69: Lehi's Dream, scissors, printed Iron Rod clip art, a yardstick (broom handle or rope), a blindfold, a plate of treats, crayons and pen or pencil. Scripture: 1 Nephi 11: 25 - "And it came to pass that I beheld that the rod of iron, which my father had seen, was the word of God, which led to... the tree of life." In the Book of Mormon (1 Ne. 8; 1 Ne. 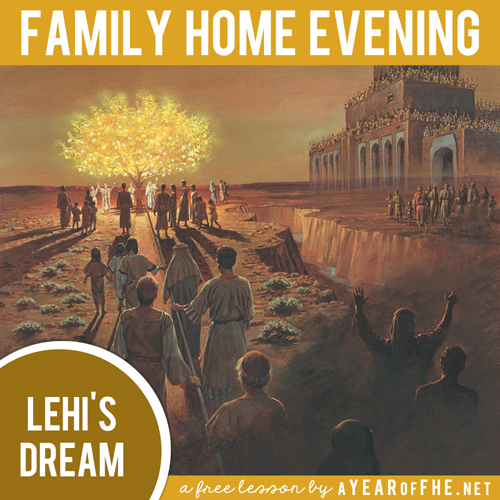 11) there is a story of an important dream given to the Prophet Lehi. 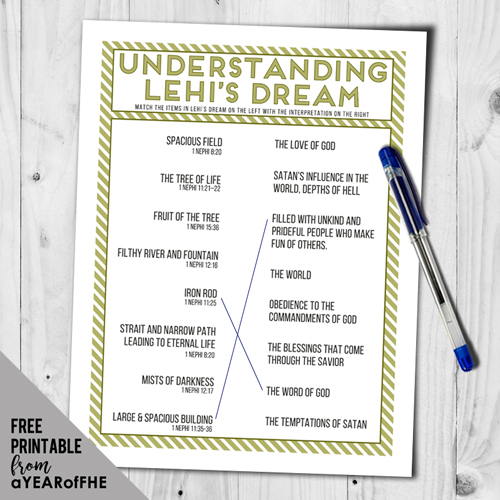 In His dream Lehi saw a man dressed in a white robe, who told Lehi to follow him. Lehi dreamed that he followed him into a dark and dreary wilderness. After traveling for many hours in darkness, Lehi prayed for help. After praying, Lehi saw a tree. The tree had white fruit on it. This sweet, white fruit made those who ate it happy. Lehi tasted the fruit, and it filled him with joy. Lehi wanted his family to eat some of the fruit, because he knew that it would make them happy also. Lehi saw a river of water near the tree. At the head of the river he saw Sariah, Sam, and Nephi. Lehi wanted his family to taste the delicious fruit. Lehi called to his wife and sons to come and taste the fruit. Sariah, Sam, and Nephi came and tasted the fruit, but Laman and Lemuel would not come. Some held tightly to the rod of iron and were able to get through the darkness to the tree. Then they ate the fruit of the tree. People in a large building on the other side of the river made fun of those who ate the fruit. Some who ate the fruit became ashamed and went away and were lost. Lehi saw many people. Some took hold of the iron rod. They came through the darkness and tasted the fruit. Other people were headed for the large building. Some were drowned or lost. Laman and Lemuel would not come and eat the fruit. Lehi was worried about them. He tried to help them believe in the gospel and obey God’s commandments. 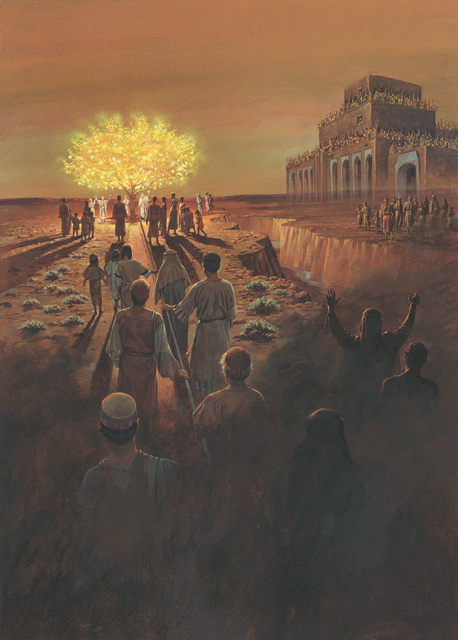 The Lord told Nephi that the Iron Rod is the Word of God and the fruit on the tree is Eternal Life (or getting to live with Heavenly Father again. Sometimes it is hard to stay on the right path and do what is right. Sometimes people will make fun of us, like the peiople in the spaciuos building. We can decide that we will be happy by keeping the commandments—by holding on to the iron rod. If we study the gospel by attending church, listening to Prophets, and reading the scriptures, we can have live with Heavenly Father again and have Eternal Life. Hold on, and do what’s right! They lead us to His light. Bear your testimony about the happiness that comes into your life when you read and follow the Word of God and keep the commandments. Practice Song: If you are teaching your family the JANUARY Song of the Month, go over the words and music with your family. Place a plate of cookies or another desirable treat (you may choose to use cut apples or other fruit) at one end of a room. One by one, blindfold each child and spin them around twice. Explain that the blindfold is like the Mists of darkness. Have them attempt to make it to the plate of treats (make sure there is nothing they might trip over or get hurt on). Next, have them hold to the "Rod" which can be a length of rope, a broom stick or yard stick. Hold the other end of the rod and have the child (still blindfolded) make their way to the treat. Once they arrive let them eat it. If you have chosen a sweet treat or fruit you may choose to liken the taste to the "sweetness" of the gospel. Ask the child how they felt when they finally made it to the "fruit". Explain that we can have the same feelings of happiness and joy when we make the right decisions and follow God's council. Thanks for all your hard work and time put into this site!! This is awesome! I can't wait to do tomorrow's lesson. Last week was fun but I think the kids will really enjoy week 2!!! The clip art is great!! I just found you last week and am so excited this makes FHE fun and easy. My husband struggles with going to church and he is trying to work on it so I think having FHE on a regular basis will help him to think about it during the week I hope Thanks for sharing, we are all here for special reasons, the Lord knows we can all help each other some how, no matter where we live. Thanks again! Our goal this year is FHE every Monday, I found your sight and love it. I needed help and encouragement to do this, I have 3 boys and my husband is a non member, you are truly a blessing. Thank you so much for all of your work in putting these lessons together; they are wonderful and will bless the lives of so many families! I am excited for this lesson tonight! I will post pictures and let you know how it goes tonight. Thanks! We really enjoyed the lesson from last week, and can't wait for tonight! I remember doing a similar FHE lesson growing up... it was one of my favorites for sure. Thanks for all your hard work!!! My kids are going to LOVE this activity. Thank you SO much!! Thank you! We loved it. The lesson was fast, fabulous and easy to follow without having to read from the page. That really helps. I love the fact that I can download it and print it out. Very helpful for an FHE lesson my family has to do in front of some folks at a retirement center. Thank you, thank you!!! Thank you so much for all your hard work!!!! We are trying to get back in the habit of daily family scripture study. This is the perfect lesson to get us started! Thank You! Kids loved this one. I really am so greatful for this resource. Thanks again! 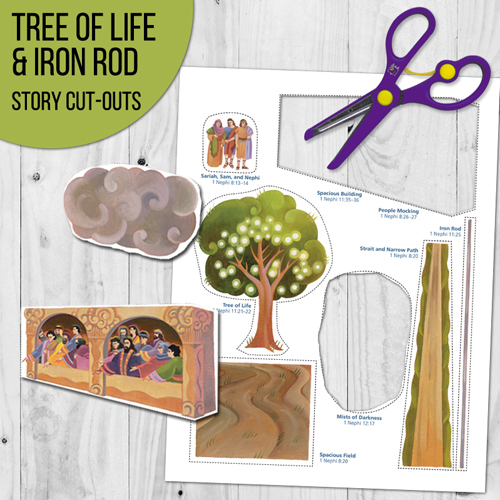 I cant seem to get your Iron Rod clip art to open up. Would you be able to send it to me somehow?